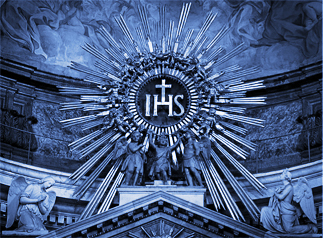 In the Catholic tradition of many centuries, the month of January has been dedicated to the Holy Name of Jesus. Today, in particular, the Church celebrates the great Name of salvation as an optional memorial. I was struck while celebrating Mass today by the beauty of the orations. Neither in the Collect nor the Prayer over the Offerings nor in the Prayer after Communion does the name “Jesus” appear. What a marvelous omission! Catholics of a certain age would remember the custom of preachers to avoid the overuse of the Divine Name, substituting instead equivalents such as “our Blessed Lord,” “Christ our Savior,” etc. By limiting their employment of that most sacred and powerful Name, the preachers of old and the prayers of the new Roman Missal intend to cultivate a practical reverence for the Son of God. This is not, however, the only tradition. In fact, the man most responsible for spreading the Holy Name devotion in the Church, St. Bernardine of Siena (d. 1444), was also responsible for the insertion of the Name, “Jesus,” into the prayer, Hail Mary. Therefore, the approach of St. Bernardine was to increase the frequency of the Name’s utterance. A similar example is found in the missionary work of the North American martyrs, who wrote the Name, “Jesus,” on trees throughout the forest as an aid to the conversion of the Iroquois people. It would seem, then, that there are two legitimate traditions. This diversity, in itself, is a beauty of the Church. But perhaps what is most significant is not which tradition we choose to follow. Whether we withhold our expression of the Divine Name or speak it frequently, our purpose should be the same: to render honor unto Him Whose Name it is. Laudetur Iesus Christus — Nunc et in aeternum!